The popularity of marine plants in the aquarium is no more evident today than in the addition of a “refugium”. The use of a refugium is a natural, beneficial way to balance and promote a healthier marine aquarium. A refugium can be defined as any separate system that is connected to another tank for the purpose of creating a protected environment for beneficial marine flora and fauna to grow without predation by fish and invertebrates. They typically contain small amounts of live rock, various macro algae, and a deep sand or mud bed. These systems can not only improve the water quality of marine aquariums by removing nitrates, phosphates, carbon dioxide and some metals, but in time can provide a live food source for many marine species by hosting different larvae and invertebrates. A typical system is illustrated to the right. There are many commercially manufactured refugiums available today, in a wide array of styles and sizes to suit almost any desire or need. Many of these add-on systems are getting larger and more advanced so that hobbyists with large aquariums can enjoy the benefits of a refugium with reduced maintenance and care. The most popular style of refugium is one that is placed directly under the main tank as part of a continuously flowing system that allows the tank water to move through the sump and then back into the main system via a return pump. This style often includes a pre-filter sock or other media that traps large debris before entering a separate lighted chamber where marine macro algae and/or plants are grown. Most models also have separate chambers for a return pump and/or a protein skimmer. For those wanting a larger surface area or a more custom design, a simple system can be made out of almost any container or aquarium sturdy enough to hold sand, rock, water, etc. Dividers can be made of cut sheets of glass, acrylic or screens to separate the mechanical and biological components. For aquariums that lack the space below the main display, there are several options. First, a separate tank can be placed beside, behind or above the main display tank and plumbed with an overflow box and/or bulkheads. This style can present some challenges, but allows for the most visibility and enjoyment of the refugium. 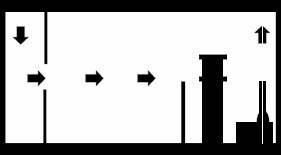 Another option is a small hang-on-the-back refugium as illustrated to the right. These smaller versions can be added to systems that lack the appropriate space to include under the main display tank or for aquarists that don’t want it in direct view. These most often include a small circulation pump that draws aquarium water from one end of an acrylic box and out the other end. Although small in size, they can be effective in smaller aquariums up to 30 gallons. Flow rates can vary greatly in these systems, but most favor a high turnover ratio, as much as 10x the water volume per hour. Larger display tanks featuring corals and invertebrates can benefit from even higher flow rates. In their natural environment, most marine flora and fauna live in a dynamic place, with strong currents and constantly changing tidal surge, so they are quite accustomed to adapt to varied levels of water movement. Most available refugiums include a light, usually a 9w to 18w compact fluorescent bulb. 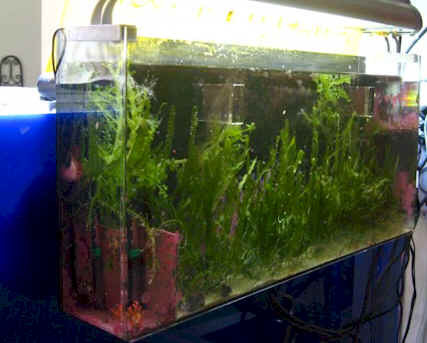 While the amount of light may be fine for some macro algae, such as Chaetomorpha, Ulva and possibly a few varieties of Caulerpa, it is often more desirable if space is available, to upgrade to a higher output light source, such as t-5 fluorescents or for outstanding growth a 70 watt DE metal halide fixture. Overall, it depends on the size of the refugium and what the purpose of it will be. For most, the concept of a refugium is to export nutrients quickly and efficiently, so why deprive the algae of what it needs to thrive with a low light environment? On the other hand, if the purpose of the refugium is to provide an area for the reproduction of invertebrates to feed the main tank then strong lighting to provide optimal growth is not necessary. On any tropical shoreline where there are shallow, flat stretches of soft sediment that is not subject to heavy wave action you will most likely find extensive beds of sea grass comprised of single or multiple species, often closely intermixed seeking to gain their share of sunlight and nutrients from the near mud like substrate. Seagrass communities are among the most productive communities in nature providing habitat for large populations of invertebrates and fish, and acting as some of the richest nursery and feeding grounds to be found anywhere on earth. Seagrass - The primary producers With four families, twelve genera and about sixty species (Sullivan 1994) the seagrasses have been able to colonize all relatively warm locations providing a unique and very diverse habitat regardless of the species or mixture of species found. Although there are many seagrass beds comprised of single species found elsewhere in the world, here in the Philippines there is high diversity of speices (seven to nineteen according to various sources) and the grassbeds are most always of mixed species. Locally the most common species are the very large bladed slow growing and long lived (10 years) Enhalus acoroides, the short wide bladed Thalassia hemprichii, the short very thin bladed Syringodium isoetifolium and the short, paddle shapedHalophila ovalis. Each of the four species plays a role in the formation of the grassbed's climax canopy. With nearby open sandbeds, the Halophila acts as the pioneering species, being the first to establish itself in uncolonized sand acting to anchor the sand and preparing it for the Thalassia and Syringodium species to follow through rhizome growth. It is only when sufficient growth by the previous species has stabilized and enriched the sandbed through their leaf litter that the large Enhalus species establishes itself, which it appears to do more frequently through seed dispersal than by rhizome growth. I have only observed this large species being located in the central regions of the grassbeds indicating to me that it or its seeds were late arrivals onto the scene, giving the shorter lived, faster growing species time to prepare for its arrival while having spread far beyond their point of origin. The paddle shaped Halophila ovalis having pioneered open sand substrate allowing Thalassia hemprichii to follow. A young seagrass bed having been fully colonized by Thalassia hemprichii and Syringodium isoetifolium thus overgrowing and pushing out the pioneer Halophila ovalis. The thick layer of leaf litter has yet to accumulate as found in mature beds. A mature seagrass bed containing multiple species of seagrass and having developed a thick layer of leaf litter. The fully developed canopy also provides yet another habitat utilized by many fish and invertebrate species, some being full time residents while others follow the tide in from the deeper reef to hunt for food within these very rich hunting grounds. What seems most important for the associated species is the provision of shelter and food supply resulting from their extraordinarily high rate of primary production. The formation of coastal seagrass beds also help to provide the required conditions for the fringing coral reefs by slowing the flow of water and allowing sedimentation to occur before such particulates can become a hazard to the corals. Seagrasses also provide coastal zones with a number of other benefits including wave protection, oxygen production and protection against coastal erosion by anchoring the sediments in place and preventing their drift. The nursery habitat that is created and sustained by the seagrasses is an important contribution to the fisheries, greatly adding to the number of fish that reach adult size having been afforded the protection and food provided by the seagrass ecosystem. Seagrasses are monocotyledonous vascular flowering plants. They are unique in that they are submerged in the seawater, possess a rhizome/root system with stems buried in a soft substrate, have vegetative and sexual reproduction and have flowers fertilized by water-borne pollen. Seagrasses are the only true marine plants as all other "vegetation" found in the ocean are algae. While not a true grass, they are called grasses simply because their long, green leaves superficially look like the terrestrial grasses from which they evolved from. Seagrass sediments - A place of complex nutrient dynamics and home to many species. The seagrasses are considered to be ecosystem engineers since they partially create their own environment simply by growing and living in most soft, sandy sediments. Once established by the pioneer species, their extensive root systems take up nutrients which are then transported to the leaves.Upon the leaves’ death and detachment, they will settle on the surface of the sediment and through decomposition not only return a portion of its sequestered nutrients to the sediment, but will also create the acidic conditions through decomposition that releases even more adsorbed nutrients from the sediment in which it grows. All of the nutrient exchange is also utilized by the multitudes of infauna that through their own actions within the sediment contribute to the distribution of nutrients and thus the growth of the seagrasses. I feel it is noteworthy to point out that other studies done in locations outside of the Indo-Pacific region have come to different conclusions concerning the nutrient dynamics of seagrass sediments. This may be due to differing sediment compositions as well as the different seagrass genera found in those locations. Not all seagrasses have the same requirements nor the same abilities in nutrient extraction/transportation. Since this article is examining a Philippine (Indo-Pacific) seagrass habitat, I have tried to use only the reference material that pertains to these locations. This should not pose a problem for the aquarium hobby as the majority of our aquarium systems are based on the Indo-Pacific regions and their calcium carbonate sediments. I also want to stress the fact that the nutrient dynamics involved in any seagrass ecosystem is extremely complex and not something I can or am willing to fully explore in a single hobby article. I will however do my best to touch upon the most obvious of the actions involved as they do pertain to our keeping of marine aquaria. As with any plant, light and nutrients are the primary requirements for growth. With the surrounding sea water often having undetectable amounts of dissolved nutrients, the seagrasses derive the majority of their nutrients directly from the substrate by way of their root. Although the leaves can also uptake nutrients from the water their primary purpose appears to be conducting photosynthesis and storing nutrients transported by the roots. The nutrient concentrations within the water are usually so low that uptake by the leaves is considered insignificant relative to root uptake of nutrients from the sediment (Erftemeijer 1993). As with any plant or algae that utilizes both phosphorous and nitrogen, they can be limited by not enough of one or the other. How much of one or the other is available is determined by numerous factors, most of which involve the geochemistry of the sediments that the seagrass finds itself growing along with the availability of organic matter that is broken down through decomposition, the primary source of both nitrogen and phosphorus regardless of the sediment's composition. Any good farmer knows that phosphorous and nitrogen within the soil is the key to a good crop in nutrient poor soils, hence the heavy use of fertilizers in farming operations. This holds true for seagrass as well. The ability of a substrate to provide the essential dissolved nutrients has been shown to be determined by the composition of the sediment (Short 1987) in of its composition, either terrigenous (land-based eroded rock) or calcium carbonate. The grain sizes also determine the nutrient dynamics involved. It has been shown (Erftemeijer 1993) that Indo-Pacific, near-shore sediments comprised of terrigenous material has a significantly higher pore water concentration of nitrogen compounds than the calcium carbonate-based sediments while the reverse is true of phosphorous compounds. This can be explained by the geochemistry found to occur within the various sediments and at varying depths within those sediments. The two sedimentary environments investigated by Erftemeijer showed considerable differences in sediment composition and nutrient availability. Total P and N were much higher in the terrigenous sediment in comparison to the nearly 100% calcium carbonate sediment The difference was attributed to the terrigenous study area being near a river inlet causing an increase of organic matter from terrestrial sources. However, the exchangeable phosphate was considerably higher in the calcium carbonate sediment and was attributed to the much stronger adsorption affinity of the carbonate matrix to phosphate in comparison to the terrigenous sediment. Additionally, the apparently high levels of phosphate within the upper few centimeters of the carbonate sediment can be attributed to the carbon dioxide and acids produced as a result of aerobic decomposition of organic material and oxidation of reduced sulfur compounds. These acids may cause the dissolution of calcium carbonate and the phosphate that had been adsorbed onto the calcium carbonate, resulting in a net enrichment of porewater phosphate. Within the upper few centimeters of calcium carbonate sediments, bacterial fixation of N2 (Capone 1992) accounts for a large fraction of the NH4 produced within or released from the upper layers of the sediments, having a turn over rate of less than twenty four hours. Capone has found that denitrification can be detected, even in apparently oxygen rich sediment, possibly accounting for the lowered nitrogen content in relation to phosphate content and thus limiting seagrass growth to being more dependant upon phosphate when growing in calcium carbonate sediment. Again, the reverse is true when the sediment is comprised of terrigenous materials. The relatively high availability of phosphate in porewaters from coarse-grained carbonate sediments in seagrass beds found within the study (Erftemeijer 1993) is in contrast to the general assumption that seagrass growth on carbonate sediments is phosphorus limited (Short 1987). But that study was working in fine-grained sedimentary environments (carbonate mud and silt) while another study (McGlathery 1992) found evidence of nitrogen limitation. Given the apparent discrepancies between nitrogen and phosphate limitations on seagrasses within the various studies done to date, Erftemeijer concludes that the grain size of the sediment is one of the primary factors determining the availability of phosphorus in a tropical carbonate sediment. This is something to keep in mind when constructing a live deep sand bed for an aquarium. Life within the sediment - The Recyclers A few members of the sandbed infauna : Foraminiferans and their remains are clearly the most abundant of the visible life forms found within the sediment. Not surprising given that Dr. Ron Shimek has sampled foraminiferans with a density of over 70,000 per square yard of ocean bottom. Polychaete worms and nematodes are also found in great abundance. Most are microscopic containing both predator and prey species. By just their sheer numbers and relative mobility, they account for a great deal of the nutrient processing and recycling within the sediment and by their movements through the sediment help to turnover the sediment's layers. Two of the largest sediment dwellers that ingest sediment grains digesting any organics attached to the grains and any detritus that may have been pulled into the sediment. Their movement also irrigates and disturbs the sediment. Epiphytic Organisms - Important producers within seagrass habitats. The high productivity of seagrass beds is the product of not only the seagrasses but also a variety of epiphytic organisms that use the vast amount of surface area provided by the seagrass leaves on which to grow. The most abundant of the epiphytic organisms are the microalgae, providing as much as 46% of the autotrophic production of seagrass beds. Since seagrasses are not known to produce any toxins or have any mechanisms to control the attachment and growth of epiphytes, epiphytes can be found on all exposed parts of the seagrass. Though the presence of epiphytes on the leaves of seagrasses is a natural phenomenon and contributes to the productivity of a seagrass ecosystem, eutrophication can cause abnormally high rates of epiphytic macroalgae and microalgae growth leading to the complete shading of the seagrasses and their subsequent loss. Algae are not the only organisms that quickly take advantage of any substrate that affords them a position in the sunlight or water currents much to the detriment of the smothered individual leaf. The sacrifice of individual leaves creates a much greater benefit to the seagrass meadow as a whole and is responsible in large part for the high rate of productivity which in turn fuels the complex ecosystem and nutrient food web that extends far beyond the confines of the seagrass meadows. Epiphytic growth while seemingly detrimental to the seagrass may also benefit those plants that grow in areas that tidal movement exposes them to the air. With a coating of epiphytic life forms, moisture retention is enhanced and may allow the seagrass to avoid desiccation (Bell 1997). As each leaf is covered in epiphytes, the ability of the leaf to perform photosynthesis is reduced and reaches a point where the leaf is of no use to the plant anymore. The leaf is cast off, along with any epiphytes unlucky enough to have settled on what seemed a permanent home. The cast off leaf now further enriched with other life becomes part of the leaf litter mat and is acted upon by bacterial and fungi creating the detrital matter that so many other organisms find of use. Having lost a leaf, the plant then pulls even more nutrients out of the sediment to create a new leaf to regain its photosynthesis capacity and makes sediment bound nutrients available once again. In turn, yet another new surface area arises for the epiphytes to colonize, and so the circle begins again. With individual leaf life spans having been estimated to be anywhere from 3 to 10 days, there is a vast amount of organic material that a seagrass meadow is producing in a single week. Benthic microalgae (microphytobenthos) while very important in other shallow ecosystems do not contribute to the biomass and productivity in any significant amount within a mature seagrass bed. The lack of benthic microalgal activity is attributed to the sediment being shaded by the seagrass leaves, its leaf litter and the thick layer of detritus that blocks the sunlight and prevents photosynthesis from occurring. In a developing seagrass bed the benthic microalgae would play a larger role in nitrogen fixation within the sediment since it is unlikely that a sun blocking layer of leaf litter and detritus would accumulate for quite some time. This microalgal layer may account for the added nutrient enrichment that the pioneering seagrass species need to gain new territory. Epiphytic & Off Shore Drift MacroAlgae - Damaging intruders or contributors? A tropical seagrass meadow will also likely contain macroalgae species (Bell 1997) that have either grown as epiphytes on any of the available surfaces or having been carried into the area by water currents and snagged on the seagrass blades. In mature seagrass meadows, the unstable leaf litter does not present many substrates on which to attach other than the seagrass leaves or the larger exposed rock fragments. I have noted marked seasonal variations in the abundance of macroalgae within the seagrass meadows. During the monsoon season there is an obvious increase in the amount of macroalgae present due to frequent storms that create enough force that detach epiphytic or benthic macroalgae and drive them into the seagrass areas. During the relatively dry season, storms are rare allowing the epiphytic macroalgae to remain where they have attached or settled. The storm driven macroalgae that finds itself stranded within the seagrass meadows at the end of the monsoon season is most often left undisturbed during the dry season allowing the algae to stabilize and grow only to be torn away at the start of the next monsoon season. The macroalgae, having grown larger, now presents more surface area to the water currents. I believe this and the lack of a stable substrate ensures that the macroalgae do not dominate or destroy the seagrasses and the result is that they are mostly transitory. During the relatively brief stay within the seagrass meadow, the macroalgae will continue to remove nutrients as they would anywhere else that they can grow. They take from the local nutrient pool only to transport the nutrients elsewhere when the season changes and the macroalgae is set adrift once again. Eventually the macroalgae's luck will run out and they will be washed up onshore, snagged on the coral reef eaten by herbivores or sink into the abyss. Either way the macroalgae has transported a fraction of the seagrasses productivity elsewhere. Being seasonal and dependant upon the severity of the monsoonal storms, how much nutrient transportation takes place can be highly variable from year to year. I have not observed any detrimental affects of any significance by the epiphytic or drift macroalgae as they are transitory in nature. Any damage done is restricted to small localized areas and is temporary (i.e. the macroalgae can shade/smother an individual seagrass plant and cause its demise). If the macroalgae is an epiphyte upon the seagrass leaves, the loss of the seagrass can also mean the loss of the macroalgae as it is dropped into the leaf litter. If the macroalgae is adrift, the loss of the seagrass leaves will most likely allow the macroalgae to drop down onto the leaf litter and find itself becoming shaded and smothered, as well as possibly being consumed by the local herbivores. This all points to transient macroalgae having their nutrients either transported into the seagrass ecosystem by drift, or having their nutrients and any additionally gained nutrients through growth being transported out of the seagrass ecosystem or simply being recycled back into the seagrass ecosystem through herbivorous action and decay. Near-Shore Ulva spp. - Now you see it, now you don't. Ulva spp. are another drift macroalgae that can also affect the seagrass community. Where the drift macroalgae mentioned previously originate from further offshore in relation to the seagrasses locale, the Ulva sp. originate near the shoreline prior to the seagrass meadow. Following the seasonal cycle of the tropics, of which there are only two, a wet monsoon season and a dry season both of equal duration, limits the impact that these algae may have on the seagrass to a few months of the year when heavy rains wash the land and create eutrophic conditions near shore. I have often wondered at how such a loosely attached and often free floating algae could seem to completely disappear for many months only to make a rapid reappearance seemingly out of no where, hence the title of this section. The answer lies within its life cycle and within the local seasonal variations. Ulva follows a reproductive pattern called alternation of generations, in which it takes two generations to complete its life cycle, one that reproduces sexually and one that reproduces asexually. Although mature members of both generations look the same to the naked eye, microscopic chromosomal differences distinguish one from the other. The first generation, which has two complete sets of chromosomes (2n), the second generation has only one set of chromosomes (n). The first generation, called the sporophyte, undergoes asexual reproduction to form spores, tiny reproductive cells that develop into mature individuals called gametophytes. Gametophytes produce gametes, male and female reproductive cells that fuse together during fertilization to produce a zygote, an organism with two complete sets of chromosomes that matures into a sporophyte, thus completing the life cycle. Ulva spp.are relatively simple when compared to more advanced algae and vascular plants. They do not differentiate into tissue layers or show much specialization among cells, making them a colony of like cells forming new cells perpendicular to the surface which gives this species their distinctive thin "tissue paper" appearance. Since each cell, including the reproductive cells, are capable of photosynthesis, the uptake of nutrients and adjustments to light intensity is very rapid. Due to their high nitrogen requirements and their limited ability to store nitrogen, Ulva distribution is nitrogen limited and explains their seemingly quick appearance and subsequent disappearance after heavy rainfalls. Such occurrences make Ulva spp. good bioindicators of local water quality pertaining to its level of nitrogen enrichment. In such areas of constant enrichment, Ulva spp. become a permanent feature and can easily smother all benthic organisms found below it. It is worth noting that there are no local Ulva populations here that could account for the sudden growth observed during periods of eutrophication after heavy rainfalls. This leads me to conclude that their zygotes are being carried in from distant locations that do contain permanent populations due to year round nitrogen enrichment as found near sewage discharges or river inlets. Once nutrient conditions favor local growth, these algae can make a very sudden appearance near the shoreline. As they grow they will begin to settle on top of the bare sand and rubble substrate nearshore to the seagrass meadow and remains near shore. I at first attributed the shallow water propensity of Ulva to one of light intensity but have since learned that its appearance in near shore shallow water is simply a matter of available nitrogen through terrestrial runoff and only remains near shore due to a lack of sufficient wave disturbance. A study of U. lactuca (Hansen 1992) has shown that this macroalgae can compensate for reduced light intensity by its ability to rapidly increase its cellular chlorophyll content and has its highest rate of growth with a mere 10% of available ambient light. These facts do not bode well for the marine habitats as the only limiting factor of U. lactuca appears to be the availability of nitrogen, making any relatively shallow habitat vulnerable to being smothered by its rapid growth should nitrogen eutrophication occur over extended periods of time. With their appearance and having reached a sufficient size to present enough surface area to be uplifted by storm driven waves the algae is then carried offshore by tidal action where they become entangled with the seagrass leaves. I have not noted any detrimental affects to the seagrasses other than the localized loss of single leaves due to shading by these macroalgae. Upon the loss of the leaves, the attached Ulva are either dropped down into the leaf litter where local grazers consume it or if left uneaten, will in a matter of days die as any available dissolved nitrogen is quickly consumed. Upon decomposition its limited nitrogen content does not appear to have any long term consequences as I have observed this local seasonal phenomenon since 2004 with no apparent loss of seagrass cover to date. Bacteria / Fungus - The workhorses of all environments. Other than the much larger fish and animal grazers, most other animals can not directly consume seagrass due to its fibrous composition. The bacteria and fungi are the dominant consumers of seagrass primary production once such production has been added to the leaf litter and begins decomposition. By their actions upon the cast off leaves they break down the fibrous material making it available to the majority of animals that otherwise would not be able to utilize seagrass production. Bacteria not only use organic matter supplied by the seagrasses, but also any organics that have been recycled from animals and previous bacterial activities. While the bacteria and fungus first make the cast off seagrass blades available to most other animals through decomposition, they also process the waste from the animals that benefited from their originally breaking down the seagrass production. They also utilize the byproducts of their own decomposition which results in a net gain of nutrients available to the seagrasses, and the bacteria and fungus themselves are food for many other animals in the form of detritus. The nutrient net gain is further enhanced by the geochemistry that occurs within the sediment as briefly discussed above concerning nutrient availability per sediment composition and grain size. The microbial mats found on the surfaces of both the sediment and the leaves of the seagrasses are composed primarily of cyanobacteria that have a dual role related to productivity by fixing carbon dioxide and atmospheric nitrogen which often limits primary production in many other ecosystems (Hamisi 2004). The cyanobacteria found in such mats also provide food to the heterotrophs. The inorganic nitrogen released by the heterotrophs utilizing the cyanobacteria, supports continued primary production by seagrasses in another cycle. As the seagrass leaves are decomposed they release both particulate and dissolved carbon and organic matter, which the bacteria and fungus assimilate and transform into detritus (also known as marine snow), a nutritionally important food source for detritivores. With a wide range of animals that consume detritus in all habitats throughout the oceans, it is of no surprise that given the massive production found within seagrass meadows the diversity of detritivores is equally as massive. Examples of some common detritivores both below and above the sediment. Nematode sp. Cirratulid sp. Polychaete sp. Foraminiferan sp. Synaptid sp. Holothuridea sp. Copepod sp. Amphipod sp. Isopod sp. As each animal consumes and then digests the detritus, a fraction of the digested food, mostly the amino acids and protein fragments will be used by the organism to build or repair tissues. Some of this will eventually be recycled and eliminated from the organism's body as ammonium in urine. The rest of the digested foods, primarily the carbohydrates and most of the lipids will be utilized in cellular respiration, oxidized to produce energy. Eventually they get eliminated from the organism as carbon dioxide and water (Shimek, 2002). The Grazers - Of seagrasses and epiphytic algae In a previous study (Thayer 1984) done on the effects of large herbivores feeding upon seagrass productivity, the large herbivores were found capable of exerting an influence on the seagrass nutrient web and the stimulation of seagrass growth. Fish, sea turtles, sea urchins and dugongs that graze directly upon the seagrasses, representing at least 10% of their diet, can significantly alter the nutrient and detrital pathways by exporting the nutrients out of the seagrass meadows by swimming away and defecating elsewhere. Their grazing can also have both a stimulatory and negative impact on plant production affecting community structure and function. I have observed that the once much more abundant local large herbivores no longer have a significant effect on the seagrass community, the numbers of such grazers have been greatly reduced or eliminated by human activities within the relatively shallow areas that lack any enforcement of management regulations. With the uncontrolled harvesting, the local seagrass nutrient web has lost an important nutrient export link through the elimination of their primary herbivores. This is a pandemic problem. In areas where grazing by large herbivores still occurs, the seagrasses have a below ground reserve of available nutrients which allows the seagrasses to recover rapidly to levels that equal or exceed those in nearby ungrazed beds. In areas of intense grazing, these reserves have a stabilizing influence by allowing the seagrass to persist as their rhizomes and roots are largely left intact and able to quickly produce more leaves (Valentine 1999). Such grazing contributes much more to the transportation and disturbance of seagrass nutrients elsewhere than is found to occur locally in this study area. With the loss or significant reduction of all local large herbivores due to human predation, the only remaining major herbivore with any significant population is the inedible (to humans) Diadema sea urchin. During my translocation study of this species I was able to determine that adult sea urchins restricted themselves to the immediate area surrounding their shelter, only venturing out during darkness to graze within a meter or two of their daytime shelter. Such self-restriction limits their impact on seagrass to only those sea urchins that have found suitable shelter on the edges of the seagrass meadows or in the deeper depressions within the seagrass meadows that contain a suitable rocky substrate in which to gain shelter from. Those depressions that do contain sea urchins graze most macroalgae from the hard substrate as well as the seagrasses that extend into the depression. This constant clearing of all algae and plant growth creates suitable conditions for the settlement and growth of a number of coral species, that in their growth provide more substantial shelter for the sea urchins. Is this the birth of a shallow inshore reef? During the first two months after the end of the monsoon season, large numbers of Diadema setosum gather together and roam across the seagrass meadows grazing upon the epiphytic macroalgae species clearing their path of such growth while releasing some of the macroalgae nutrients back into the seagrass ecosystem as waste and detritus. Such congregations are what I believe to be the sea urchin's strategy to ensure a mate is always nearby while also having an abundant and readily available food source to gain or regain the energy and nutrients expended by sperm/egg production. Astralium okamotoi is the most abundant of the gastropods within the local seagrass meadows, not selective in its feeding, leaving only the encrusting species behind. Other commonly found snails include the Euplica sp., Trochoidea sp. and the Cerithidae sp. Phanerophthalmus smaragdinus is one of many herbivorous slugs, possibly a detritivore as I only find them amongst the leaf litter where they can avoid predation. The only large gastropod found, feeding upon the epiphytic and drift macroalgae that it can reach as it is restricted to the floor of the meadow due to its size. Its movement on and in the leaf, detritus litter and sediment helps to distribute nutrients through disturbance. Human collection for food has greatly reduced their numbers. Salarias fasciatus also known as the lawnmower blenny is the most numerous of the herbivorous fish with small juveniles found amongst the leaf litter making forays up to the seagrass blades to forage the epiphyte algae growth. During periods of high tide, schools of both adult and juvenile rabbitfish species enter the seagrass meadows to graze upon drift Ulva spp. and seagrass epiphyte growth. The herbivores shown above are only a sample of the most commonly found species, there are of course far to many others for me to include. The Larger Predators - Some are transitory, others are full time residents.Both fish and invertebrate species find the seagrass meadows to be rich hunting grounds. Many fish species, especially larger predators, are transient residents as the seagrass beds become too shallow for them during low tides. Invertebrate predators such as this Archaster sp. (sand sifting starfish) are permanent residents of the seagrass beds as they consume the infauna of the sediment. Other large invertebrate predators include most other starfish species, hermit crabs, the swimming crabs and many other crustaceans. Fish Predators such as this pipefish are also abundant given the high productivity of the seagrass ecosystem. As shown above, fish such as this pipefish species are clearly full time residents, evident by their coloration and markings allowing them to blend in with the seagrass. File fish species also take the same colorations and markings while the flamboyantly colored fish species make themselves obvious as to their having come into the seagrass meadows from the coral reefs and are thus transitory opportunists. Schools of both juveniles and subadult Plotosus lineatus (striped sea catfish) are a common sight as they leap frog over each other sifting detritus and sediment infauna. Local Seagrass Distribution - The various hues of green in the below photograph are not entirely due to seagrass growth. The healthy seagrass meadows are found between the shoreline out to the 2 meter depth range, beyond that depth the frondose macroalgae dominate with an outer band of kelp growth prior to the coral reef. The seagrasses found at depth prior to the coral reefs are at their toleration limits having shorter and fewer leaves with individual plants widely spaced in comparison to those plants found in the shallows. As shown below the vast flat expanse greatly reduces the wind driven waves and slows the effect of tidal flows providing a shallow, sheltered and near calm environment critical to the formation of composting leaf and detritus mats that are responsible in large part for the high productivity of seagrass meadows. Disturbances - Weather, water movement and fauna As mentioned throughout this article, the feeding activities and movements through the seagrass, detritus and sediment as well as climatic and tidal events cause disturbances. These disturbances of the nutrients are yet another important factor in the seagrass nutrient web. During periods of storm activity the larger than normal wind driven waves can uplift and suspend the leaf and detritus litter, moving large amounts of organic matter either towards shore or far out to sea with the tides and making the nutrients available to a large number of other animals outside of the seagrass habitat. After periods of unusually strong winds and high waves, the shoreline can accumulate large mounds of wind and wave driven leaf litter that decomposes on shore releasing nutrients that wash back into the ocean through rainfall runoff spurring the growth of shoreline filamentous algae and thereby transporting the seagrass productivity elsewhere. Such transportation also occurs when the prevailing tide and winds carry the leaf litter and detritus out to sea and deposits it onto the coral reef. Carried far enough, the organic material can find its way to the deep ocean and drift downwards thousands of feet, being consumed and broken down further by pelagic plankton and fish and microbial action in the deep benthos, only to be carried back to the surface again in areas of ocean upwelling. Upwellings then fuel the production of plankton, contributing once again to the recycling of nutrients made available to the coral reef inhabitants. Complex. The only single word that best describes the diversity and nutrient webs that the seagrass meadows provide. Doing the research for this article has made me much more aware of what used to be a little thought of habitat, giving me a greater appreciation and a sense of gratitude that the seagrass meadows are where they are. Without such meadows, the coral reefs that we tend to focus on would be less for it. Having explored a natural seagrass meadow we now turn our attention to the keeping of seagrass within an aquarium. Given the conditions and the nutrient dynamics discussed pertaining to natural meadows we now have a greater understanding of their needs and what they can bring to a reef aquarium system. When used as a refugium plumbed into a reef display aquarium the nutrient processing and production of an aquarium reef system is enhanced and negates the need to use equipment and other products that attempt to do what nature does best, if allowed to. Sediments - The seagrass refugium's sediment is vital to the health and long term survival of the seagrass just as it is in natural meadows. How you construct the sandbed is going to determine its functionality in providing a nutrient rich environment for the seagrasses rhizomes and root structures. Seagrasses are plants that depend upon their roots for the uptake of nutrients, roots that require extremely fine grain sizes, it will be imperative that a calcium carbonate substrate with grain sizes ranging from 0.2 - 1.02mm be used with a depth of no less than six inches, deeper if possible. Incorporating a live mud into the sediment during the sand beds construction will ensure a suitable number of infauna are introduced. Just as in nature the infauna are critical to the functionality of any sandbed to process nutrients and prevent the formation of sand clumps by their movement through the sediment (Shimek 2001). Patience - With the refugium plumbed inline with the rest of the aquarium system now comes the most difficult part of it all. The wait. It will take at least six months to one year for the sediments to have become enriched enough to support the requirements of the seagrasses (Calfo 2005). To rush the introduction of the plants will most likely ensure their loss. Having been uprooted, transported and their root systems likely damaged, the plants will need everything to be in their favor to get off to a good start. Indo-Pacific Plant Selection - With the construction of the sandbed having been completed you now have at least six months to determine which species are available to you and study their husbandry. My experience with any of the seagrasses is limited to the indo-pacific species yet through my study and recent attempts at keeping indo-pacific seagrasses it appears they all share some basic needs and care requirements, evident by their all being found within the same seagrass meadow. Halophila ovalis appear to be the most tolerant of less than ideal handling and capable of surviving being shipped with bare roots and wrapped in moist paper towels for a number of days (Borneman 2008). Being a pioneer species may account for this hardiness as they are frequently the first species to grow into uncolonized soft substrates. This apparent ability to go where no plant has gone before would in my opinion make them the best candidate for establishing a seagrass habitat with the later introduction of other seagrass species. Their very short growth and relatively low lighting needs in comparison to other seagrasses make them ideal for placement in coral reef aquariums as there is no danger of this seagrass shading or becoming abrasive to the corals and will tolerate the lowered light intensity found at the aquarium's sediment level. Thalassia hemprichii - While not as common as T. testudinum (shown in the photo), the two species share very similar morphology and husbandry requirements. Given such similar morphology, I doubt many hobbyists can distinguish between the two other than by knowing where they were collected. With T. testudinum being an Atlantic species it is most likely that those hobbyists in the United States will use this species as their first seagrass keeping attempt(s) as it would be the most readily available of the species. While not impossible to maintain, this species does appear to be sensitive to uprooting and the subsequent exposure to air. Syringodium isoetifolium - Second only to the Halophila sp. in its ability to colonize. I have found S. isoetifolium to be hardy and fast growing. It transplants much easier than the Thalassia sp. with a high rate of survival. This species would make a good addition to either a newly established or mature seagrass aquarium, able to colonize rapidly while making a suitable companion species with established Thalassia spp. Normally not growing as tall as the Thalassia, it is not affected by partial shading and with their very thin, tubular leaves they pose no risk of shading the wider bladed Thalassia spp. either. These traits between the two genera may explain their combination being the dominant structures in natural seagrass meadows here in the Philippines. Enhalus acoroides - With leaves averaging a length of 130cm and 3cm wide with root systems that can extend well beyond 30cm deep, this species is not a realistic choice for home aquarium systems. For scale, the floor tiles shown in the photo are each a square foot with the plant being so long that I had to stand on a chair to get the entire plant into the frame. However, if one were to set up a suitable aquarium for this species it would make for a very unique display. The affect of such a planted aquarium would be reminiscent of a kelp forest. Lighting the Seagrass Aquarium - Given the environment the seagrasses are found in as discussed previously it should be obvious that they require high light intensity to thrive. Estimates from various studies (Kenworthy 1996) done on the minimum lighting requirements of seagrass species have shown that their lower toleration limit to be in a range from 24% to 37% of the light just beneath the water surface which equates to photosynthetically active radiation (PAR) levels of between 200 to 600 PAR at wavelengths between 400nm and 700nm. Levels below these minimums result in the seagrasses producing shorter and fewer leaves, obvious indicators that more light intensity is needed over the aquarium. Extended periods of light levels below their minimum requirement places a stress on the seagrasses that some species are unable to recover from. Halophila spp. are the exception and have much lower lighting requirements. Since most hobbyists have their own preferences in the lighting systems that they use, I am not going to suggest any particular type of lighting and instead stress again the importance of light intensity to the seagrasses. How that intensity is provided is irrelevant unless it has an impact on animals being kept within the same system due to heating of the water.Water Flow & Temperature - Tropical seagrasses have a high thermal tolerance averaging 90 degrees fahrenheit and live close to their thermal limits in the shallow, protected environments they are found in. An aquarium that maintains the average Indo-Pacific coral reef water temperature of 82F is well within the temperature range that tropical seagrasses are adapted for, those aquariums that maintain lower than normal coral reef temperatures may encounter slower seagrass growth and their failure to thrive. Temperature is second only to light intensity pertaining to tropical seagrasses primary needs. Water flow through the seagrass aquarium should not include the use of powerheads or other high flow pumps and instead simply allow the overflow volume from the rest of the system to provide bulk water movement that will not suspend the leaf litter and detritus and encourage diversity of fauna and infauna. Water Parameters - Being a plant, the seagrasses utilize the same common nutrients as terrestrial plants. Nitrogen, phosphorus, iron and carbon dioxide, most of which is absorbed by the roots from the sediment with the exception of carbon. Phosphorus will not normally be a limiting factor in an aquarium system due to the input the system receives through the addition of food. Nitrogen and iron is more likely to be utilized first by algae and bacteria and may become limiting to the seagrasses. These limitations can be overcome by the use of plant food sticks or tablets (Borneman 2008) pushed down into the sediment near the plant's roots. It is unlikely that nutrients provided in this manner will have any affect on the system unless the sediment is disturbed allowing the release of the nutrients into the circulating water. Planting the Aquarium - Now that the long wait is over with the sediment having been given time to sequester nutrients and the plant species selected for planting, its time to break out the gardening tools and... actually you will need nothing more than your gloved hand to accomplish the delicate task of placing your seagrasses into the sediment. The roots of seagrasses are fragile with any damage done being the biggest factor in losing purchased plants. This is unavoidable when purchasing seagrasses from commercial sources as the roots are usually stripped of any sediment to lessen the shipping costs involved with heavy sediments (Calfo 2005). A good reason to start out with the hardier species that are known to have a relatively high survival rate when transported in such a manner. If seagrasses are being shared or purchased from a local established seagrass aquarium then you have the opportunity to collect individual plants with less damage or disturbance to the roots by gently moving the sediments to expose the rhizome and cutting the rhizome with scissors in six inch lengths. Once cut, gently lift the plant so as to keep as much of the root attached sediments intact and place the plant in a suitable container while being held under water (Borneman 2008). Having collected seagrasses from the local meadows, I have found that it is much easier to properly plant such lengths of the seaweed by simply making a trench in the aquarium's sandbed and gently place the rhizome and its roots into the trench and cover with sediment. Do not force or push the rhizomes into the sediment as it will only break the rhizome and cause further damage. Again, having access to the local seagrass meadows means that I can take extra measures to tip the plants survival rate in my favor. A shallow, wide tupperware container and a spatula allows me to lift entire sod sections containing the rhizomes, roots and all of its surrounding sediment gently into a tupperware container (all done underwater) for easy transport back to my aquarium. Digging a suitably sized pit into the sandbed I can then lower the tupperware onto the sediment and gently slide the entire sod section into the pit and cover with a centimeter or two of sand. Once planted, it is not uncommon for the seagrasses to drop all of their leaves due to the shock of having been disturbed. With their relatively fast rate of leaf production, new leaves should begin to emerge within a week or two at most. You can help ensure the plant has additional nutrients to replace its lost leaves and to recover more quickly by following a tip from Eric Borneman who has had increased success with newly planted seagrasses by purchasing freshwater plant food tablets that are broken in half and pushed down into the sediment close to the plant's root structures. As with any available lighted surface, microalgae will grow upon the seagrasses leaves and shorten the leaves usefulness to the plant by blocking the available light. With Astralium spp. being the most commonly found snail consuming the microalgae on seagrass blades in natural meadows and being the most commonly sold species, they would make the best choice for keeping your seagrasses clean of epiphytic microalgae. A good stocking number to start out with would be one snail per plant, increasing their numbers if you find that the snails are unable to keep up with microalgae growth. I feel I should point out that these species are most often sold to the reef aquarium hobby not because they are suitable for our rocky coral displays, they are not, but simply because they are found in great numbers in the seagrass meadows and with the meadows being nearshore and easily accessed they are collected by simply wading through the meadow and picking them off the seagrasses without any need for scuba gear as is required to collect the snail species that are found in coral reef areas. Vermaat J.E. et al. (1995) Meadow maintenace, growth and productivity of a mixed Philippine seagrass bed. Mar Ecol Prog Series, Vol.124: 215-225.
without the written permission of the authors. At one time or another, usualy just after the addition of live rock or live sand, every one of us has noticed what looks like little "bugs" running or swimming around all over the place, usualy after the tank has been dark for some time. While few are large enough to make out any details, the use of a magnifynig glass while holding a flashlight against the side of the tank will open up a new, tiny world to you. While most hobbyists first encounters with algae is in dealing with how to control or erradicate them from their aquariums, there are also many of us who are now keeping many of the macro (large) algae species as part of their system's landscape, of which only increases the biodiversity of such systems and is a great help in maintaining the balance between nutrient imports and exports. Since it would be of higher interest to those trying to deal with problems in algae control, I will try to provide the information and links that I have found to be of use in this area first. A check list of what you can do to deny problem algae and cyano bacteria the conditions they need to thrive. 1. First, understand that algae and cyano bacterias will always be a part of your system, there is no way you will ever eradicate it totaly. Having to clean an algae film from your aquarium's glass every few days and keeping a few herbivores such as snails, is just part of keeping any type of aquarium. But when algae dominates your system and threatens to outcompete and smother your corals, action must be taken. (A) We must also realize that a new setup is going to take time for its biology to get established and for any controls to take effect. Six months to a year is not an unreasonable amount of time for a system to balance out. Remember, this is a hobby that demands patience. (B) The entire battle that is fought with any algae or bacterial problems can be traced back to being an issue of nutrients. 2. Your freshwater sources : Starting out with and continuing to use as pure a freshwater source as possible is probably the single best thing that you can do to tip the odds in your favor. Tap water is usualy loaded with impurities and nutrients that will fuel excessive algae growth. As such, I believe that one of the first peices of equipment that you should purchase is an RO/DI water filtration system, if that is not possible right away, then at least use distilled water when making up your saltwater. 3. Water changes : As an old saying goes within this hobby, " the solution to pollution is dillution". Doing frequent large water changes is, in my opinion, THE single best thing you can do for your entire system. Not only are you removing (dilluting) out nutrients, you are also removing a host of other elements that will build up in an enclosed system while at the same time, bringing other much needed and used elements back up to proper levels without having to become a chemistry major and doing what I feel is the single biggest mistake made in this hobby, which is adding additives and supplements. 4. Limit the nutrients you add to the tank : Everything you feed the tank wether its "bad" water, supplements or fish/coral food will add to the importation of nutrients, which will then be used by algae. (A) Limit or stop using flake or pelleted foods which contain high levels of phosphates and other excessive nutrients. Frozen prepared foods or fresh seafoods are a much better choice. (B) Do not add Iodine supplementation. The only "fact" that has been proven is that algae consumes and holds a great quantity of this element. All of the claims of invertebrates or corals needing amounts greater than found in natural sea water are ancedotal and have yet to be proven. If you want alot of algae, add Iodine. 5. Examine your stocking levels of fish. Quite often an aquarium will be overstocked with fish that the system's biology can not deal with. Fish being the greatest source of nutrient importation by their just being alive and our having to feed them. 6. If you can not beat them, then join them : Using algae itself to uptake and lock up nutrients is a highly effective and much more natural method of nutrient control. Having a sump compartment or another tank used to cultivate algae which can then be trimmed and thrown away will help to deny those algae in the show tank the nutrients they need to grow. 7. Use herbivores such as snails to consume that algae which will grow within the show tank. The following links will be of use and interest regarding algae and cyanobacteria control. Reef Aquria as Ecosystems - "Discussing marine reef aquaria as ecosystems and how we should manage them using an ecosystem or holistic approach, as opposed to the micromanagement philosophy that seems inherent in most reef aquarium husbandry." The types of algae in marine aquria - "Pond scum, kelp, red tides, seaweed and "that film on the glass". These are but a few of the many names that are used to describe the algae. These are the plants of the sea. It is a huge assemblage of organisms with species numbering in the tens of thousands." Algae Control Tips - "A selection of useful tidbits of information and tricks for the marine aquarist submitted by Advanced Aquarist's readership"
Nuisance Algae in the Reef Aquarium - "In this series of articles I will explain the different types of fuel that allow these unsightly algae to take over an aquarium." Clean up Crews - "What I intend for this article is to give some general ideas to the various "clean-up crew" participants that are available and their usefulness to the marine aquarium." Use of Mangroves - "Mangroves have become increasingly familiar additions to marine displays and refugia"
Dinoflagellates - "Many dinoflagellates are photosynthetic and are among the major primary producers of the phytoplankton along with diatoms." Diatoms & Silica - "Silica is a chemical that is feared by many reef keepers. Visions of a reef tank covered with diatoms so thick that you can not see through the glass come to mind." Cyanobacteria webserver - "Cyanosite is dedicated to the information transfer within the cyanobacterial research community"
A species of Chaetomorpha, fast growing and excellent for nutrient exporting. In our battle with the micro or nuisance algae, you will find many references to using macro (large) algae as a means to export nutrients that fuel the algae types that we need to control. What is usualy over looked is the fact that many of the larger algae are quite pleasant to look at and provide a much more natural landscape, such can be said of the sea grasses as well. The following links will relate to their identification and care tips. Caulerpa Algae - It is quite common within the hobby to use any number of Caulerpa algae species as a means to control nutrient levels within our reef aquariums. Given that this group of algae only do well with higher nutrient levels than what we strive to maintain within our systems, I would only recommend their use for those aquariums that constantly struggle with higher than normal nutrient levels. There are a few dangers or concerns to be aware of if this algae group is kept. - Caulerpa species are fast growers, and do so with strong holdfasts that anchor the algae to the substrates making them difficult to remove. Even with their removal, any remaining holdfasts on the substrate can regenerate and make these species difficult to be rid of once established. If you do wish to keep these alage, I would do so outside of the main display aquarium within a refugium. - With the fast growth, comes faster nutrient uptake, which is what we would want when struggling with water quality issues brought on by excessive nutrients. The problem with the use of these species is that they are found in the wild only in near shore areas that contain higher nutrient levels than that found out on the coral reef. When the nutrient levels fall, the algae will suffer and most likely go into sporalation (method of reproduction), This is characterized by the algae becoming translucent and disintegrating, this can happen very quickly. When it does happen, if enough of the algae is present it can foul the water and result in mass die off. As such, I would only use these species temporarily to get excessive nutrients under control (water changes would be more effective) and then switch to other macro algae species of which the majority of them require lower nutrient levels to live in than the caulerpa species. - Caulerpa species also contains a toxin called caulerpenyne which makes it undesireable to most herbivores, the toxin is also released anytime the algae is broken and possibly just leached from the algae as it grows. The toxin can over long term exposure or with high amounts have deleterious effects on inverts and fish. The toxin can be removed with the use of activated carbon, and I would suggest if you intend to keep the caulerpa then you should use activated carbon somewhere in the system. As you can see, the use of any of the Caulerpa algae would most likely not be a good idea as there are better and safer alternatives to bringing high nutrient levels under control in my opinion. If you do keep these algae, I would be aware that as your aquarium's nutrient levels start to fall, you risk having it suddenely die off. Not a good thing to have happen. Algae in the coral reef envrionment - "Competition for space with other attached organisms is one of the main factors controlling growth of the marine flora." Beyond the Refugium, A macroalgae primer - "This series will focus on algal marine plants and attempt to highlight their more desirable and beautiful attributes." A Planted Aquarium - "Seagrasses, until recently, had earned only an obscure place in marine aquaria as occasional, short lived accents in full blown reef tanks or as nutrient export plants in refugiums." Macroalgae for landscaping - "A very well put together guide"
The SeaPlants Handbook - A very comprehensive site and a great resource for algae identification. Algae Identification - "This is basically a "visual" page where photos of different forms of algae and possible biological control critters can be seen." Calurpa Sporulation - "I'm sure most hobbyists that have kept Caulerpa in their refugium or display tank know about or have experienced this algae's reproductive activity." Since life on this planet would not be possible without them, including within our aquariums, I feel that we should take some time to get to know at least a few of the bacterial families that are of concern to our aquarium's biology. Knowing what certain strains need provides us with the knowledge on how to either control them, or promote them. Bacterial Diversity Study Guide - Get to know our friends and our enemies. Bacteria - Wikipedia's very informative article and the source of the following information. CyanoBacteria Link #2 Link #3 - "Though cyanobacteria do not have a great diversity of form, and though they are microscopic, they are rich in chemical diversity." A note on the "red slime removers" - Being that the cyanobacteria are just that, bacteria. Such products use an antibacterial medication to kill off the cyanobacteria. To me, this should only be done as a last resort and not something to rely upon on a regular basis. If the problem is so great that all your efforts to be rid of it fails, then I would consider killing it not with any of the products available, but by simply using the main ingredient those products contain, which is listed below. Of course such treatment should only be done when the cyanobacteria's food source(s) are limited and controlled. Such products usualy contain either Erythormycin (white in coloration) or Tetracycline (yellow in coloration). Also note that the product "ChemiClean" contains Erythromycin. Most bacteria may be placed into one of three groups based on their response to gaseous oxygen. Aerobic bacteria thrive in the presence of oxygen and require it for their continued growth and existence. Other bacteria are anaerobic, and cannot tolerate gaseous oxygen, such as those bacteria which live in deep underwater sediments. The third group are the facultative anaerobes, which prefer growing in the presence of oxygen, but can continue to grow without it. How Bacteria Eat: Like all living organisms bacteria need to eat in order to live, grow and reproduce. However, bacteria are far too small to have a mouth. Instead they have special channels in their cell walls and cell membranes which allow, or even assist some molecules to cross. Once the molecules are inside the cell they can be broken down into their componant parts before being rebuilt into the macromoloecules the bacteria needs in order to build and repair itself, or generate energy. Unfortunately for the bacteria the surrounding environment is not always full of free-floating molecules of the correct sort. Instead, the molecules may be all bound together. To solve this problem bacteria have evolved the habit of leaking enzymes out into the environment around them. These enzymes then do what ever it is they do, attack specific tissues and molecules (proteases attack proteins, cellulases attack cellulose etc) and break them up into smaller units. Eventually molecules of a size that the bacteria can take into itself are made that the cell can then absorb through the channels mentioned above. Bacterial metabolism is classified on the basis of three major criteria: the kind of energy used for growth, the source of carbon, and the electron donors used for growth. An additional criterion of respiratory microorganisms are the electron acceptors used for aerobic or anaerobic respiration. Cellular respiration describes the metabolism reactions and processes that take place in a cell to obtain biochemical energy from fuel molecules and the release of the cells' waste products. Energy is released by the oxidation of fuel molecules and is stored as "high-energy" carriers. The reactions involved in respiration are catabolic reactions in metabolism. Nitrification is the biological oxidation of ammonia with oxygen into nitrite followed by the oxidation of these nitrites into nitrates. Nitrification is an important step in the nitrogen cycle in water. The oxidation of ammonia into nitrite, and the subsequent oxidation to nitrate is performed by two different bacteria (nitrifying bacteria). The first step is done by bacteria of the genus Nitrosomonas and Nitrosococcus. The second step (oxidation of nitrite into nitrate) is done by bacteria of the genus Nitrobacter, with both steps producing energy to be coupled to ATP synthesis. Denitrification is the process of reducing nitrate and nitrite, highly oxidised forms of nitrogen available for consumption by many groups of organisms, into gaseous nitrogen, which is far less accessible to life forms. Denitrification takes place under special conditions in marine ecosystems. In general, it occurs when oxygen (which is a more favourable electron acceptor) is depleted, and bacteria turn to nitrate in order to respire organic matter. Because our water is rich with oxygen, denitrification only takes place in areas such as our sandbeds where oxygen is very limited. by J. Charles Delbeek B.Ed M.Sc. Advertisements for various reef related products are often accompanied by photographs of spectacular aquariums, heavily stocked with corals, sponges and macroalgae. Using these as examples of the "ideal" aquarium, many hobbyists try to duplicate these scenes with limited success. The question then arises as to why? Often the hobbyist feels that he/she is at fault and tends to spend hundreds of dollars on more and/or better equipment. They may also fall prey to the syndrome of changing their approach on a weekly basis depending on which "expert" they last spoke with or whose article they last read. Eventually they become frustrated in being unable to attain the "ideal aquarium" and drop out of the hobby. I can't help but feel at times that they may have been mislead from the very beginning. Perhaps those aquariums didn't really exist, at least not in the long run. You see, it is very difficult to maintain a heavily stocked aquarium for any length of time. This has nothing to do with filtration or water quality, but with something else that I feel has been totally neglected by many authors and hobbyists. It may be that these photos were taken of newly set-up systems and do not represent aquariums much older than 6 months at most. I know that this is not true in all cases but one cannot deny that it is a possibility. It is very easy to produce a really stunning display by simply stocking the aquarium with newly acquired specimens. If you have overcome the problems of microalgae, water quality, water movement and lighting you may feel that you have attained the best possible conditions for your animals. Indeed you may have been too successful, for now the animals are growing and spreading over the aquarium, which will eventually bring them into contact with each other. This is where another, more insidious, problem may occur; competition for space. If one thinks of shallow coral reef areas or looks at photographs of these areas, it becomes immediately apparent that space is at a premium; the entire substrate is covered with some form of life. Why does one form not dominate over another? Obviously there must be some sort of controls that allow such a high diversity of life to exist in a limited area. Failure to recognize this fact can lead to a lot of frustration on the part of the hobbyist and can lead to many expensive losses. The purpose of this article is to point out the mechanisms that sessile (stationary) marine organisms can use to hold onto their piece of "real-estate." Competition for space is one of the most important factors limiting populations on marine hard substrata. This is why sessile colonial marine organisms such as anemones, sponges, and soft and hard corals have developed various mechanisms for defending their space and moving into new ones (Sammarco et al, 1983). There are four main mechanisms that such organisms can use: rapid growth to "shade-out" competitors, the development of aggressive structures such as mesenterial (gut) filaments, sweeper tentacles and acrorhagi, and the release of toxic compounds into the water. It does not appear that any one organism utilizes only one of these mechanisms; often they will use a variety of tactics. The growth rates of hard corals are species dependent, with certain species growing much quicker in shallow waters, than others. This is a definite advantage and allows these corals to quickly colonize new areas. A rapid growth rate also allows these species to achieve dominance over other species by overtopping them, thereby reducing the amount of light and water flow they can receive (Huston, 1985). This mechanism has been proposed as an explanation for the dominance of pocilloporid corals in the Pacific and Acropora corals in the Atlantic (Huston, 1985). Presumably this mechanism is of limited importance in a closed system due to the lack of hard corals. However, the hobbyist should not neglect the effects of overtopping and shading caused by large anemones, corals (soft or hard) or macroalgae. This can potentially occur in an aquarium and one should always ensure that a specimen is receiving adequate lighting and water circulation. Allowances should also be made for rapid growth and enough space must be allotted for such when first placing a specimen in the aquarium. Mesenterial filaments, the coral's digestive organs, can be used quite effectively as aggressive structures. When two hard corals come into contact (either different species or the same) one of them, the aggressor, will extrude mesenterial filaments through the mouth cavity or the body wall, onto the surface of the other, literally digesting it's tissue. This results in a zone of naked skeleton that can then be overgrown (Sebens and Miles, 1988). This zone can be overgrown by the attacking coral or it can be colonized by encrusting organisms, thereby creating a "buffer zone" between the two species (Huston, 1985). Acrorhagi are specialized structures that were first recognized in coldwater species of the anemone family Actiniidae. They consist of inflated sacs that protrude from below the tentacles and are loaded with stinging cells. When they make contact with another anemone they leave behind a layer of tissue that results in localized tissue death of the intruder (Sebens and Miles, 1988). It is not clear whether these structures appear in tropical specimens but you should at least be aware of the possibility. Sweeper tentacles are specialized tentacles that appear on polyps after several weeks of contact with other organisms (Hidaka and Yamazato, 1984; Sebens and Miles, 1988). These tentacles are usually much longer and thinner than normal tentacles and have many more stinging cells (nematocysts) than normal. As a result their function has changed from one of feeding to one of defense or aggression. Elongated polyps of some corals such as Goniopora, can also be used as "sweeper polyps" for aggressive purposes (Sheppard, 1979). Although the production of sweeper tentacles are usually associated with hard corals, a recent study has shown that they can also develop in soft corals (Octocorallia) such as the encrusting Caribbean gorgonian Erythropodium caribaeorum (Sebens and Miles, 1988). These sweeper tentacles were found to lack pinnules on the tentacles and had bulbous tips that were loaded with nematocysts (Sebens and Miles, 1988). Such specialized tentacles form only along the edge of the colony that is in contact with another coral, encrusting algae, or by nematocyst discharge (Hidaka and Yamazato, 1984). Ates (1989) provides a listing of aggressive hard corals, some of which are regularly kept in aquaria such as Bubble Coral (Plerogyra sinuosa), Anchor Coral (Euphyllia ancora), Favia sp., Favites sp. and Galaxea sp.. I urge you to read this article, it is an excellent discussion of the phenomenon of coral aggression from a European hobbyist's point of view. Another excellent reference is an article written by Mike Paletta (1990) which deals with aggression in hard and soft corals and provides a listing of those species commonly found in home aquaria, arranged in order from most to least aggressive. Various authors have tried to quantify the aggressive capabilities of corals and to rank them in order of aggression. Thomason and Brown (1986) found that there was a direct relationship between aggressive proficiency and the number of nematocysts per polyp and/or mesenterial filament. Interestingly, it is the number of nematocysts per structure that is important, not the size or number of the polyps and mesenterial filaments. Combining their findings with those of Sheppard (1979), various Indo-Pacific corals can be placed in the following aggressive categories: Aggressive: Fungia spp. (Mushroom Corals), Goniopora spp. (nematocysts concentrated in the polyps not in the mesenterial filaments), Galaxea spp., andAcropora spp. Intermediate: Lobophyllia spp. Subordinate: Montipora spp. and Porites spp. (Thomason and Brown, 1986). Although Acropora spp. are classified as being aggressive it is generally believed that they rely more on overtopping and asexual reproduction by fragmentation to compete for space. The small size of Acropora spp. nematocysts supports this hypothesis (Thomason and Brown, 1986). In the Caribbean, Lang (1973) classified Isophyllia sinuosa as very aggressive, Montastrea annularis as moderately aggressive and Porites spp. as weakly aggressive. Interestingly, the initial dominance of _Montastrea_ is due entirely to the action of its mesenterial filaments. However, Bak et al. (1982) found that as the length of the aggressive encounter increased, the subordinate coral was able to develop sweeper tentacles and reverse the interaction in its favour. It has been well known that many soft corals contain numerous toxic compounds such as terpenoids and sarcophine (isolated from Sarcophyton glaucum, a commonly imported Leather coral). These chemicals proved to be very efficient in deterring predators but recent evidence suggests that they are also released into surrounding waters as a mechanism for maintaining living space (Sheppard, 1979). Coll et al (1982) isolated toxic terpenes from seawater surrounding several soft corals including the common aquarium Finger or Tree Coral, Sinularia spp. The use of chemicals to inhibit the growth of one species by another is called allelopathy and is quite common in terrestrial ecosystems. In various transplant experiments using the soft corals Lobophytum pauciflorum (Devil's Hand), Sinularia pavida (Tree Coral?) and Xenia sp. (Pulsating Polyps), Sammarco et al documented the effects on the hard corals Pavona cactus andPorites andrewsi when the soft corals were brought close to the colonies or in direct contact with them. They concluded that the effects of soft corals on hard corals, and the susceptibility of the hard corals, was entirely species specific. In some cases, intercolony distances of 30 cm resulted in stunted growth and death of the hard coral, while another species of soft coral only caused damage when in direct contact with the hard coral. For example, Porites andrewsi was the most sensitive hard coral, reacting to two of the three soft corals used, even at distances of 10 cm. However, a soft coral that can cause damage by contact cannot necessarily cause damage by releasing compounds into the water. For example, Xeniacaused extensive damage to both hard corals tested only when in contact with them. On the other hand, if a soft coral (e.g. Lobophytum pauciflorum) could cause damage from a distance it could also cause damage upon contact (Sammarco et al, 1983). Through the use of toxic compounds, soft corals are able to compete with hard corals for space by stunting their growth or actually killing portions of a colony and overgrowing it. However, as we have seen, hard corals are not without their own defenses and serious damage can occur to the soft coral too. Hopefully you have now gained a better understanding of some of the mechanisms that can occur on a reef. Its now time to look at how this relates to our aquariums. When one sets out to stock an aquarium, you must take into account a number of variables such as lighting and water movement. Unfortunately, this article has now given you another to take into consideration: will coral X get along with coral Y next to it? This is not an easy question to answer as it involves mostly trial and error. The information provided here, and by Ates (1989) and Paletta (1990), should provide you with a starting point. The key is to closely watch the inhabitants in an aquarium and their reactions to the introduction of a new specimen. As an example I offer you a story related to me by John Burleson of J.P. Burleson, Inc. It seems shortly after adding a colony of Xenia to his 150 gallon display tank, he found that his prefilter began clogging at a greater rate than normal. After many weeks of carefully removing selected pieces and then returning them to the tank he found that if he removed either the new Xenia colony or his Tridacna derasa clam, the clogging stopped. Apparently, the clam would produce huge amounts of mucus in response to the presence of the Xenia in the aquarium, which would clog his prefilter material! The Xenia must have been producing something that the clam found objectionable. The issue of toxic compounds in corals is a relatively new one. Subsequently, their effects in a closed system do not appear to have been given much consideration in the operation and planning of an aquarium. Paletta (1990) suggests that soft corals not be placed upstream of other specimens but in a crowded aquarium, this is difficult to do. Also, I am unaware if the toxic compounds produced in an aquarium will accumulate or might break down in time. Can they be removed by chemical filtration or do they just build-up in the water? This is definitely an area of concern especially when it comes to keeping a highly diverse population and/or delicate specimens. Perhaps this might explain why certain corals are difficult to keep despite acceptable water quality. For example Goniopora are generally recognized around the world as difficult to keep alive for more than a year in a closed system. However, they are maintained quite easily in an open system at the Waikiki Aquarium (Sprung, personal communication). One possible explanation may be that, since they are closely related to the toxin sensitive Porites sp., they are adversely affected by the toxic effluent of other corals that might build up in a closed system. This would not be a problem in an open system as they would be constantly flushed out. When placing a coral which you suspect may belong to an aggressive genus, you should make sure that there is adequate spacing between it and other specimens. Generally, 10-15 cm should be enough but don't forget that many species can expand to many times their normal size during the coarse of the day and this should be taken into consideration i.e. don't measure only from the base! Also, if the coral develops sweeper tentacles, they may reach much further than normal polyps. Another variable that some aquarists may not consider is that many corals change their shape at night too! What you may have thought was a safe distance during the day might not be during the night due to expansion or deflation of the coral, this is especially common in soft corals of the genus Sinularia (D. Maier, personal communication). Please do not hesitate in moving a coral that you believe is suffering damage, once damaged they become more susceptible to disease, parasites and algae. The final variable to consider is growth. Ensure that the specimen has adequate space to grow, especially encrusting forms such as Xenia sp., Anthelia sp. (Waving Hand Polyps), Star Polyps (Clavalaria sp.) and zoanthids. It may become necessary to trim and separate specimens that have grown together, especially if they begin to develop aggressive interactions such that one begins to suffer. This is a great way to propagate your specimens and trade them in for something new or to help stock another aquarium. Believe me, in a successful aquarium, the day will come when trimming and culling your invertebrates will become as necessary as trimming Caulerpa! Well that brings us near the end of this series on the workings of reef systems. I hope that you have enjoyed the articles and that both novice and advanced hobbyists learned something new. As I stated at the beginning of the series, the aim of these articles was to get you thinking and not to be a how-to series. I hope that I achieved this in some way and that you have a better understanding of what a reef aquarium is and the tremendous educational potential that they harbour. The more people who see and learn how to use these systems properly, the more they will appreciate the complexity and fragility of a living coral reef. Perhaps then, there will be more of an outcry against the destruction of these ecosystems through indiscriminant fishing and curio collecting practices. Now that we have spent that last few months looking at how a reef system works, I thought it would be fitting to close out this series by taking a look at, what I consider to be, some successful aquariums. Yes folks, they do exist and I'll prove it to you, next issue I'll show you some tanks that will literally make your eyes pop out! Ates, R. 1989. Aggressive behaviour in corals. Freshwater and Marine Aquarium 12(8):104-105,107,110,112. Bak, R.P.M., Brouns, J.J.W.M. and F.M.L. Heys 1982. Complexity of coral interaction: influence of time, location and epifauna. Mar. Biol. 69:215-220. Coll, J.C., Bowden, B.F., Tapiolas, D.M. and W.C. Dunlap 1982. In situ isolation of of allelochemicals released from soft corals (Coelenterata: Octocorallia): a totally submersible sampling apparatus. J. Exp. Mar. Biol. Ecol. 60:293-299. Hidaki, M. and K. Yamazato 1984. Intraspecific interactions in a scleractinian coral, Galaxea fascicularis: Induced formation of sweeper tentacles. Coral Reefs 3:77-85. Huston, M.A. 1985. Patterns of species diversity on coral reefs. Ann. Rev. Ecol. Syst. 16:149-177. Lang, J. 1973. Interspecific aggression by scleractinian corals. 2: Why the race is not only to the swift. Bull. Mar. Sci. 23:260- 279. Paletta, M. 1990. Coral aggression in reef aquaria. SeaScope 7 (Winter):1-2. Sammarco, P.W., Coll, J.C., La Barre, S. and B. Willis 1983. Competitive strategies of soft corals (Coelenterata: Octocorallia): allelopathic effects on selected scleractinian corals. Coral Reefs 2:173-178. Sebens, K.P. and J.S. Miles 1988. Sweeper tentacles in a gorgonian octocoral: morphological modifications for interference competition. Biol. Bull. 175:378-387. Sheppard, C.R.C. 1979. Interspecific aggression between reef corals with reference to their distribution. Mar. Ecol. Prog. Ser. 1:237-247. Thomason, J.C. and B.E. Brown 1986. The cnidom: an index of aggressive proficiency in scleractinian corals. Coral Reefs 5:93-101..
A compilation of available information concerning the parasitic protozoa brooklynella hostilis. While trying to help a fellow hobbyist find information on how to treat for this parasite, it became quickly apparent that detailed information was not to be found within a singleonline search, many hours were spent to find answers to what should be considered basic questions. As such, I have done my best to compile what known facts that there are into a single page. I would like to thank Heather Ortega for her help in doing so and in providing the fish photographs shown within this page. WHAT IS IT - It is a parasitic ciliated protozoan - The ciliated protozoa are the most conspicuous and easily recognized groups of protists. They are conspicuous because they are usually motile and quite large, ranging from an average of about 50 micrometers up to 4 mm in size. They are easily recognized because they are propelled through the water by hundreds to thousands of cilia (hair like structures) that cover their bodies, aligned in long files or kineties. METHOD OF REPRODUCTION - Reproduction occurs by simple binary fission, in a process called conjugation where genetic material is passed between two individuals, much like some bacteria are able to do, The two partners usually have to be from complementary mating types and once they have fused they exchange gametic nuclei, which are equivalent to the nuclei of our sperm and eggs. After this exchange, the two partners separate. The gametic nuclei fuse and the zygotic nucleus divides. The nuclei produced develop into a new macronucleus and a new micronucleus. This process of reproduction occurs very rapidly and explains why an infected fish can easily succumb to this protozoa within a matter of hours or days. It does not have typical life cycles as other more well known parasites, which take much longer to accomplish the same damaging effects as seen with this one. LIFE CYCLE - Once reproduction has taken place, the newly formed protozoa is able to freely swim by the use of its ciliates and able to find a new host or more usually, attach to the same fish its "parents" are on, which is why you will note such a rapid progression of this parasite. Attachment usually occurs at the gills of the fish first and spreads outwards as they multiply, as this parasite feeds upon the fish, it also releases toxins that can prove fatal to the fish very quickly. Free swimming protozoa can persist for quite some time without a host to feed upon. As such, any aquarium that has had this parasite introduced to it, must remain fallow (fishless) for no less than four weeks in order for the remaining free swimming parasites to die off without a host to feed upon. As such, all fish within the aquarium must be put into a quarantine tank and treated, while being kept out of the main aquarium during that four week period. INFECTION INDICATORS - The usual first indication would show itself as rapid breathing and loss of coloration in the head area of the fish, followed by obvious excessive mucous sloughing off of the fish, Excessive mucous may not be confined to the head area, it may show up anywhere upon the fish. Scraping itself against other objects in the tank may also be seen as the fish trys to dislodge the parasite, you may also notice the fish has lost its appetite and remains listless or hides constantly. Cloudy eyes may also become apparent. Removing Stress - Do not place the quarantine tank in a high traffic area of your home, having an audience hovering over the tank is only going to frighten the fish and increase its stress levels. Wrapping the back and sides of the tank in a dark paper will give the fish a greater sense of security and increase its confidence. When approaching the tank, do so slowly so as not to spook the fish with fast movement, if done slowly, the fish will most likely seek cover in a more relaxed manner and not slam into any objects within the tank if rushed to hide. Water Quality - Poor living conditions are probably the biggest cause of stress. Within a quarantine tank, it is extremely important to monitor ammonia levels daily if not more frequently. An ammonia alert badge is an inexpensive way to be able to do so at a glance. Ensure all other parameters such as temperature, PH and salinity remain within normal ranges. Be prepared to do partial water changes if and when the need arises. Nutrition - It is very important to get the fish to eat as soon as possible. All food offered to the fish should be enhanced with beta glucan and vitamins to strengthen the fish and its immune system. Preventive Treatment - The addition of Maracyn 2 should be standard practice as it will help prevent opportunistic infections from gaining ground on an already stress weakened fish. Maracyn 2 also adds vitamins B and C to the water which may increase appetite and aid the immune system. In tank Structures - You should only use non-porous material to provide hiding and sleeping areas. PVC pipe and fittings work good for this purpose. Do not use rock or sand within a quarantine tank. It may absorb any medications / chemicals used thus reducing the effectiveness of any treatment. The use of plastic also ensures they can be sterilized for future use. TREATMENT METHODS: Formalin is the only treatment that is effective against this parasite and it can be used with scaleless fish also, but at half the recommended dosage. NOTE: Ensure you understand how to set up a quarantine tank and have it ready prior to getting a new fish, remember that ALL fish should be placed into a quarantine tank for no less than 6 weeks, never added straight to your show tank. The same can be said of anything that is "wet". Formalin 3 or a 37% formaldehyde solution : By far the most effective, and in my opinion, the only truly effective measure that will act quick enough to defeat this parasitic protozoa. DO NOT add this to your show tank, this chemical will kill your biological filter as well as any and all inverts and corals within your tank as well as rapidly depleting the oxygen levels. - Remove the infected fish to a quarantine tank, ensuring that the tank is well airated as the fish may be experiencing reduced gill efficiency. - Treat the quarantine tank's water with Maracyn or any other trustworthy anti-bacterial medication as a safeguard against secondary bacterial infections as this parasite is known to cause open skin wounds. - Have two, one gallon clean containers filled with water from the quarantine tank that the fish has been in. - The second one gallon container will be used as a rinse to remove any of the formalin from the fish before being returned to the quarantine tank. - Add one or two teaspoons of Formalin 3 to one of the filled gallon containers, this will provide a dosage of either 100ppm or 200ppm, using the lower dosage for fish species that can be considered delicate, such as the Tangs and Butterflys. - An airstone MUST be used within the treatment container with vigorous air flow as formalin will deplete oxygen levels. - The temperature of the treatment container must not be above 80 degrees. - Place the fish into the dip container for a period of between 30 to 60 minutes, of course the longer it can remain in the dip, the better, but you MUST monitor the fish at all times, if the fish shows any signs of trouble, remove the fish right away, put it into the rinse container for a few minutes and return the fish to the quarantine tank to recover. Do not attempt to dip the fish again until the next day. - The fish should be dipped once a day for a five day period. If you feel the fish is being harmed or not handling the treatment, lower the formalin dosage used and if need be, skip a day before repeating the dip. Do not use this as an excuse just because you feel sorry for the fish though. The dosage and length of time within the dip, are all things that you will have to make judgment calls on. - While the fish is in its treatment dip, replace the two gallons of saltwater that you removed from the quarantine tank, ensuring that the replacement water is of the same salinity, PH and temperature as that of the quarantine tank. - Once the fish has been treated, remove it from the dip and place it into the rinse container for an additional five minutes, this will allow any medication and loosened parasites to be rinsed off of the fish. - After each use, both containers should be emptied into a drain , rinsed well with freshwater and allowed to dry until needed again. - I would also be concerned with the quarantine tank having free swimming parasites able to infect the fish again as it returns from its dip, as such, I would have the quarantine tank set at hypo saline levels ( 1.009 sg ) prior to the fish being moved to the quarantine tank, while it is usually recommended that the salinity be lowered gradually, I feel in this circumstance, the immediate transfer to lowered salinity levels will have a two fold benefit, in that it may knock off alot of the parasites right away and may also kill off those that remain free swimming in the tank between dips. A fish is much better able to handle sudden lowered salinity than going into higher salinity. Any "shock" concerns would be minimum. Most large wholesalers and public aquariums place their new arrivals directly into hypo saline conditions upon arrival with little, if any, losses. - Since there is a concern about returning a newly dipped fish back into the quarantine tank's water, which may allow the reinfection of the fish, having two tanks in use could avoid such a chance. One of the two tanks would be drained and sterilized after the removal of the fish and filled again with new saltwater, rotating between the two tanks and sterilizing each as the fish are removed for treatment. - If you feel that you have caught this parasite in its earliest stages, or are not sure of which parasite may be infesting the fish, a long term treatment bath can be used also, this treatment plan should be used if you feel the fish is so weakened or has an unusual risk involved with the dip method. This method may also be more effective when having to treat all of your fish at one time due to the main tank being infested. - A quarantine tank has to be used also for this treatment method, formalin should never be used within the main aquarium. - The salinity of the quarantine tank does not have to be lowered to hypo saline conditions. - Aeration should be vigorous within the quarantine tank. - The fish will have to remain within this quarantine tank for no less than eight weeks if they have been in the main tank to allow the main tank to remain fishless for that time period to ensure any remaining parasites die off from the lack of a host fish. - With the quarantine tank set up as suggested / linked to, Add one to two teaspoons of Formalin 3 to each 10 gallons of water. Using the lower or higher dosage depending on the sensitivity and / or the condition of the fish to be treated. - Every 24 hours, change 25 percent of the quarantine tank's water and add another dose of formalin 3. - Continue the treatment for a five day period. Continue to do daily water changes after the four day treatment to control the inevitable ammonia issues. Note : Amquel plus can be used in conjunction with Formalin 3 to control or lock up ammonia. Notes / Concerns : Formalin is a poison , as such it should be treated and handled as you would any dangerous chemical. Please follow closely any directions by the manufacturer for its proper handling, storage and disposal. Alternative Formalin use : If you feel the infested fish may not be able to handle long term dip methods, you may want to consider using a combination of both dip and long term bath methods, in that, give the fish a one time dip treatment to knock down and remove the infestation and then place the fish into a long term bath treatment to kill any remaining parasites. I would only do this with a heavily infested fish that could be considered a sensitive species or one that is already weakened by the parasite. Hypo salinity - This is not an effective treatment, while lowered salinity may allow the protozoa to drop off of the fish, it is no guarantee that all will do so and you risk losing the fish if any remain and are able to rapidly multiply again. The speed at which this protozoa can multiply requires fast, effective treatment. At which hypo salinity methods may take too long to become effective before the possible loss of the fish. Copper based treatments - Not found to be effective against this particular parasite. Freshwater Dips - Not found to be effective, although it may provide temporary relief or used as a method to knock off as many of the parasites as possible before the fish is placed into a long term bathtreatment. This is, without a doubt, the most frequent and common problem that anyone who has a saltwater fish must eventually deal with, sooner or later. One would think that with the constant battle that we as hobbyist must endure with this creature, that there would be a great deal more detail available. As with anything concerning life within our systems, it is of great benefit to us in knowing the needs in detail, of everything we keep by design or by accident. I doubt many of us would have much success with our aquariums if we made wild assumptions as to how life is possible within our systems. If we know the details of any given animal or system, we stand a much better chance to succeed. The same can be said of those life forms that we do not desire to be in our little ecosystems. If we can understand their needs, we are much better able to attack or remove one of the needs and defeat it. As the old saying goes, KNOW THY ENEMY. Note how this parasite burrows under the fishes skin and gills, the white spots that are seen are not the parasites, but the skin reaction of the fish. The beautiful colored seahorses belong to the most magnificent and most remarkable organisms of the seas. Actually a seahorse is a fish, but a very strange looking fish. There are about 35 different species of seahorses spread all over the world, but only a small spectrum of this variety is frequently imported for aquarist purposes. While the smallest species, the dwarf seahorse, is just 1.5 inch in length, others achieve a body length up to 14 inch. When making the decision to keep Seahorses as pets, please keep in mind that they will need their own dedicated aquarium as there are few other reef fish, corals and invertebrates that are suitable tank mates for Seahorses. They also will not do well in the high water flow environments of the typical reef or fish aquarium. Prior to making any decisions, you should first be aware of what the Seahorse(s) will need as far as foods. Most Seahorses can be trained to take frozen / fresh foods but you should ensure you can obtain such foods on a regular basis. Being able to keep and/or raise your own live foods may become neccessary as not all Seahorses will readily adapt to dead foods. In all fairness to your new pets, please do as much research as possible before you make any purchases. I have listed a good many relevant links to articles that should answer your questions. If you need to ask others specific questions, then please become a member of the Seahorse.org forum. Species Listing - A listing of Seahorse species in which you can use to research which species of Seahorse you would like to keep as a pet pertaining to its adult size and any special needs. As noted above, there are concerns specific to Seahorses that you must become aware of through the study of how to properly care for them. If you have already maintained a reef aquarium, then half the battle is already won, as Seahorses are found in reef habitats and require the same water quality as other reef animals do. To further aid you in your research, I have listed what I have found to be very informative articles concering the care and feeding of Seahorses. SeaHorse Facts and Information for New Keepers - An extremely well thought out and informative article, a great place to get started. Seahorse Care : A basic guide to starting your first herd - Another good article on their care and common problems encountered. With the vast variety and just sheer beauty of tropical marine fish available, it can be overwhelming on making a decision as to what species are to be kept. In a fish only system, the options are truly staggering which sadly, leads to many fish mortalitys when we do not understand the needs and compatablity of the various fish familys available to us. As such, I have found it best to go ahead and get your favorite species and then work out from there according to what your aquarium is suited for. Of course, the "favorite" fish should be given the consideration of its needs first. Any other additions will have to have the determination made of compatability with the favored fish and any other additions already made or to be made. With coral reef aquariums, it becomes even more interesting to say the least. Not only must we take a fishes needs into account as well as compatability with other fish, we must also determine if a fish species is considered "reef safe" as well, meaning that any fish species that feed on corals or other sessile inverts would not make a good addition to such an aquarium. Please do not go into a store or visit an online source and make a purchase without first taking the effort to fully understand a desired species needs. Far to often I hear of horror storys involving deaths of fish due to improper housing and tank mates. I for one enjoy viewing an aquarium that is peacefull and healthy, sitting in front of an aquarium watching a damsel reign terror unto all other tank mates is not my idea of a relaxing and enjoyable way to spend my time. Hopefully the links I am providing will help you in making such decisions a bit easier. I also believe it is important that once a species is decided upon, learning its life style and habitat in nature will better prepare you in understanding its habits and needs. Please read the following articles to gain a better understanding of what your fish went through to become your pet. The selection of fish species to be kept can be a bit daunting since there are numerous species available to the hobby now. When chosing your pets, please take into consideration each species envrionmental needs, such as swimming room, hiding or sleeping places as well as its dietary needs. Being compatible with others of its own kind as well as with other species is also just as important. Your aqurium's size and its filtration capacity will also determine not only what you can keep, but how many as well. For fish only aquariums, I would employ filtration systems that provide alot of aerobic bacterial living space, such as provided by wet/dry drip filters. For reef aquariums, you will not only be limited to those fish species which are considered "reef safe", but also in the number of fish you will be able to keep and still maintain the low nutrient levels demanded of by corals and invertebrates. WHAT TO LOOK FOR WHEN PURCHASING A FISH - Great tips on how to purchase a healthy fish. FISH ACCLIMATION - How to acclimate your new pet to its quarantine tank and why. FISH COMPATABILITY CHART - Find out easily which species will get along with other species. CLOWNFISH AND THEIR HOST ANEMONES - Excellent article which matches clownfish species to their host anemone, Please take the time to check out this information. COWFISH CARE AND IDENTIFICATION - An great place to get the information needed when keeping this unique family of fish. Since the below listed links provide a great deal of information, I will just touch on what I believe are a few key factors in keeping most marine fish species. Feeding : It is still very common to be told that any of our fish should be fed a single meal each day with enough food put into the tank that the fish can consume within a few minutes. I believe this is yet another carry over from the keeping of freshwater fish, strange as it may sound, but marine fish and freshwater fish are very different in almost every aspect other than the basic fish shape. One very important difference is that marine fish move food through their digestive tracts much faster. This is due to the fact that marine fish spend their entire day picking away at extremely small food items, mostly zooplankton that drifts by in the currents, while some species will also pick off small food prey from the substrates as well. Regardless of wether the food is stationary or drifting by, it is all very small amounts. As such, their digestive systems have evolved to match how much the fish normaly consumes at one time, and being very small amounts, it allows the digestive system to move the food through much faster than their freshwater counterparts. So when we feed the fish one large meal, the majority of that food ends up shooting right out their butts as partialy digested food, meaning that a good deal of that food is not only wasted, since the fish gained nothing from it, but it also adds a significant source of nutrients to fuel algae growth and degrade our waters quality. Since the fish only recieved that one meal, and could only gain a fraction of the nutrition out of it, they are in effect, slowly starving. Knowing this, I feed my fish very small amounts at one time, and at frequent intervals throughout the day (at least three times) to ensure I am providing their digestive systems with a better suited feeding regime. Fish Size : How many of us have bought a tang or large angelfish species as juveniles and put them into our 40 or 50 gallon aquarium? I know I have, and it was not long before I wished I had not. I of course told myself just as many of you did, that I will get a larger aquarium before the fish gets too large for the aquarium it is in now. Yeah, like that ever happened. Which means I ended up having to either trade the fish in, (always at a loss also) or give it away to someone who had the proper environment for it. While stressing out the fish the entire time. Thankfully, for me, I learned that lesson a long time ago and do not find it hard now to restrain myself from impulse "gotta have that!" purchases or captures. Although I could get away with it now since its only a matter of driving down to the ocean and releasing the fish, I would still rather not have to tear my aquarium's landscape apart just to catch one fish. But the one only real good reason to not do this, is that it simply is not fair to the fish. Yes, I know, they are just "fish", but once we designate something as a pet and not a food item, that designation brings responsibility with it, or at least it should. Since it seems that a good many of us do not fully understand the actual differences between saltwater and freshwater fish, and why saltwater fish need to be acclimated to our aquarium's salinity, yet can go right into either hyposaline (lowered salinity) or a freshwater dip, the below should clarify that there is indeed a great difference between the freshwater and saltwater world. These fish are hypotonic to their surroundings. This means their blood has a higher water concentration than the surrounding sea water. As sea water passes through the mouth and over the gill membranes, water molecules diffuse out of the blood into the sea water by osmosis. They can also only afford to produce a very small volume of urine. Drinking sea water brings a large quantity of salt into the blood and this has to be removed. To replace the water they lose, saltwater fish drink sea water. To produce a small a volume of urine they must have a low rate of filtration of water into the kidney tubules. This is done by having a kidney with relatively few small glomeruli. Salt is removed by chloride secretory cells in the gills, which actively transport salts from the blood into the surrounding water. These fish are hypertonic to their surroundings. This means their blood has a lower water concentration than the surrounding fresh water. As fresh water passes through the mouth and over the gill membranes, water molecules diffuse from the fresh water into the blood by osmosis. These fish must produce a very large volume of urine to balance this large intake of water. This large volume of urine carries salt with it, and the salt has to be replaced. To produce a large volume of urine the fish must remove a large volume of water from the blood by having a high rate of filtration into the kidney tubules. This is done by having a kidney with many large glomeruli - capillary networks from which fluid is filtered at the start of the kidney tubules. Salt replacement is solved by chloride secretory cells in the gills, which actively transport salts from the surrounding water into the blood. THE NUTRITIONAL VALUE OF LIVE FOODS - PART TWO - What better way to increase the health of your fish than by providing it will some very nutritional diets. THE USE OF QUARANTINE TANKS - This should be one of your first purchases and used for everything. FISH CARE GUIDES - Basic care information of some of the more popular fish families kept. FISH PROFILES - Detalied care and feeding information on a great number of fish families. WHAT FISH EAT - A good article explaining the dietary needs of fish. HOW TO CATCH / REMOVE A FISH - There will come a time when you will have to do this. Still not sure of what a specific species needs ? Ask Dr. Frank Marini within his forum which is dedicated to the care and husbandry of marine fish. FISHBASE.ORG - A very large fish index. Photo Thumbnail pages per common names, click on any photo for more details. CLOWNFISH AND THEIR HOST SEA ANEMONES - Best resource for such information. PICTORIAL GUIDE TO FISH DISEASES - Finding out what troubles your fish is half the battle, this link also includes treatment plans. SPECIES SPECIFIC FORUM TOPICS - Kelly Jedlicki's forum discussions concerning a wide range of problems specific to certain species. Still having trouble identifying a disease or need more information ? Ask Kelly Jedlicki within her forum, which is dedicated to the Disease, Heath and Wellness of marine fish. THE PRODUCTION AND USE OF LIVE FOOD - A very indepth guide on how to culture your own live foods. PHYTOPLANKTON CULTURING - An extremely good "how to" article. ROTIFERS AND HOME CULTURE - A great article on a common fish frys first food item. THE CULTURE OF CILIATES - A very well thought out article. THE CULTURE OF BRINE SHRIMP - A step by step guide and one of the best overall articles I have found. THE CULTURE OF COPEPODS - A good how to article. THE CULTURE OF MYSID SHRIMP - Great fish food! SPAWNING AND REARING THE YELLOW WATCHMAN GOBY - The title says it all. BREEDING CLOWNFISH - An indepth guide to breeding and rearing clownfish. RARECLOWNFISH.com - A forum dedicated to the breeding of clownfish species. Photographic Time Line of Clownfish Egg and Larvae Development - Get a close up look at the changes each day brings, a movie is also included. BREEDING THE BANGGAI CARDINAL FISH - A great article on this species care and breeding. BREEDING THE GREEN WOLF EEL BLENNY - While neither an eel nor a blenny, this fish is a very interesting species. BREEDING THE NEON GOBIES - Great article that can be applied to a great many goby speices. LARVAL BASE - An online guide used to indentify fish larvae (fry). While often overlooked as a pet, there are a number of eel species that can be kept with suitably compatable fish. Other more large and aggressive species will of course need an aquarium dedicated to them. A LOOK AT FISH-SAFE EELS - A great article which will help in making your species selection. EEL CARE PROFILES - Species specific pages concerning their care.